NASA Astronaut Peggy Whitson set the endurance record for time in space by a U.S, astronaut today, Monday, April 24, during her current stint of living and working aboard the International Space Station (ISS) along with her multinational crew of five astronauts and cosmonauts. Furthermore Whitson received a long distance phone call of exuberant congratulations from President Donald Trump, First Daughter Ivanka Trump, and fellow astronaut Kate Rubins direct from the Oval Office in the White House to celebrate the momentous occasion. “This is a very special day in the glorious history of American spaceflight!” said President Trump during the live phone call to the ISS broadcast on NASA TV. As of today, Whitson exceeded 534 cumulative days in space by an American astronaut, breaking the record held by NASA astronaut Jeff Williams. “Today Commander Whitson you have broken the record for the most total time spent in space by an American astronaut. 534 days and counting,” elaborated President Trump. Trump noted that thousands of school students were listening in to the live broadcast which also served to promote students to study STEM subjects. “Peggy is a phenomenal role model for young women, and all Americans, who are exploring or participating in STEM education programs and careers,” said President Trump. How does it feel to break the endurance record? Trump asked Whitson. “It’s actually a huge honor to break a record like this, but it’s an honor for me basically to be representing all the folks at NASA who make this spaceflight possible and who make me setting this record feasible,” Whitson replied from orbit to Trump. NASA astronaut Jack Fischer is also serving aboard the station on his rookie flight and also took part in the phone call with President Trump. Whitson is currently serving as Space Station Commander of Expedition 51. She most recently launched to the ISS on Nov 17, 2016 aboard a Russian Soyuz capsule from the Baikonur Cosmodrome in Kazakhstan, as part of a three person crew. At the time of her Soyuz launch she had accumulated 377 total days in space. She holds several other prestigious records as well. Whitson is the first woman to serve twice as space station commander. Indeed in 2008 Whitson became the first woman ever to command the space station during her prior stay on Expedition 16 a decade ago. Her second stint as station commander began earlier this month on April 9. Whitson also holds the record for most spacewalks by a female astronaut. Altogether she has accumulated 53 hours and 23 minutes of EVA time over eight spacewalks. Overall, Expedition 51 involved her third long duration stay aboard the massive orbiting laboratory complex. “This is an inspirational record Peggy is setting today, and she would be the first to tell you this is a record that’s absolutely made to be broken as we advance our knowledge and existence as both Americans and humans,” said NASA acting Administrator Robert Lightfoot, in a statement. When she returns to Earth in September she will have accumulated some 666 days in space. Trump made note of the science and commercial industrial work being carried out aboard the station. “Many American entrepreneurs are racing into space. I have many friends that are so excited about space. They want to get involved in space from the standpoint of entrepreneurship and business,” said President Trump. Indeed the private SS John Glenn Cygnus cargo freighter just arrived at the ISS on Saturday, April 22, carrying nearly 4 tons or science experiments, hardware, parts and provisions. Whitson was one of two ISS astronauts involved in capturing Cygnus with the Canadian built robotic arm for attachment to the stations Unity node. Trump also mentioned his strong support for sending humans on a mission to Mars in the 2030s and for NASA’s development of the SLS heavy lift rocket and Orion deep space capsule. A SpaceX commercial Dragon cargo ship returned to Earth today, Friday, Aug. 26, 2016, by splashing down safely in the Pacific Ocean – thus concluding more than a month long stay at the International Space Station (ISS). The vessel was jam packed with some 1.5 tons of NASA cargo and critical science samples for eagerly waiting researchers. The parachute assisted splashdown of the Dragon CRS-9 cargo freighter took place at 11:47 a.m. EDT today in the Pacific Ocean – located some 326 miles (520 kilometers) southwest of Baja California. 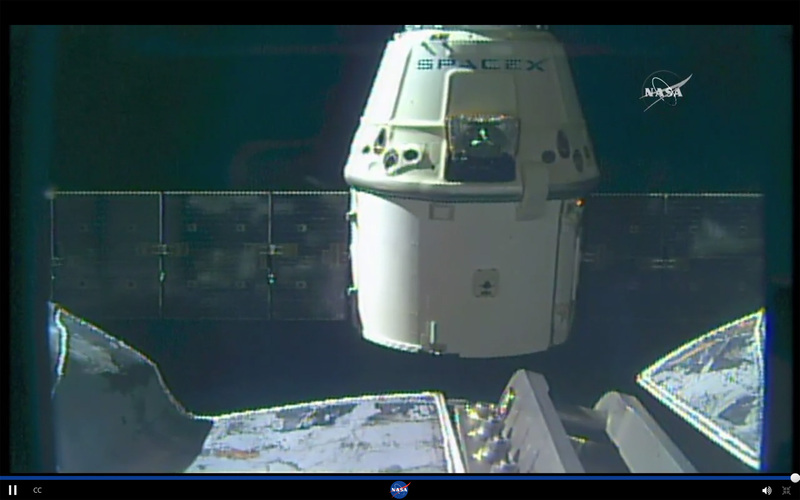 Dragon departed after spending more than five weeks berthed at the ISS. It was loaded with more than 3,000 pounds of NASA cargo and critical research samples and technology demonstration samples accumulated by the rotating six person crews of astronauts and cosmonauts living and working aboard the orbiting research laboratory. This station based research will contribute towards NASA’s strategic plans to send astronauts on a ‘Journey to Mars’ by the 2030s. Dragon was launched on July 18 during a mesmerizing post midnight, back-to-back liftoff and landing of the SpaceX Falcon 9 rocket in its upgraded, full thrust version. The SpaceX Falcon 9 blasted off at 12:45 a.m. EDT July 18, from Space Launch Complex 40 at Cape Canaveral Air Force Station in Florida and successfully delivered the Dragon CRS-9 resupply ship to its preliminary orbit about 10 minutes later. SpaceX also successfully executed a spellbinding ground landing of the Falcon 9 first stage back at Cape Canaveral Air Force Station’s Landing Zone 1, located a few miles south of launch pad 40. The dramatic ground landing of the 156 foot tall Falcon 9 first stage at LZ -1 took place about 9 minutes after liftoff. It marked only the second time a spent, orbit class booster has touched down intact and upright on land. The stage was set for today’s return to Earth when ground controllers robotically detached Dragon from the Earth-facing port of the Harmony module early this morning using the station’s 57.7-foot (17.6-meter) long Canadian-built robotic arm. Expedition 48 Flight Engineers Kate Rubins of NASA and Takuya Onishi of the Japan Aerospace Exploration Agency (JAXA) then used Canadarm 2 to release Dragon from the grappling snares at about 6:10 a.m. EDT (1011 GMT) this morning. “Houston, station, on Space to Ground Two, Dragon depart successfully commanded,” radioed Rubins. The ISS was soaring some 250 miles over the Timor Sea, north of Australia. Dragon then backed away and moved to a safe distance from the station via a trio of burns using its Draco maneuvering thrusters. The de-orbit burn was conducted at 10:56 a.m. EDT (1456 GMT) to drop Dragon out of orbit and start the descent back to Earth. SpaceX contracted recovery crews hauled Dragon aboard the recovery ship and are transporting it to a port near Los Angeles, where some time critical cargo items and research samples will be removed and returned to NASA for immediate processing. SpaceX plans to move Dragon back to the firms test facility in McGregor, Texas, for further processing and to remove the remaining cargo cache. Among the wealth of over 3900 pounds (1790 kg) of research investigations loaded on board Dragon was an off the shelf instrument designed to perform the first-ever DNA sequencing in space and the first international docking adapter (IDA) that is absolutely essential for docking of the SpaceX and Boeing built human spaceflight taxis that will ferry our astronauts to the International Space Station (ISS) in some 18 months. During a spacewalk last week on Aug. 19, the initial docking adapter known as International Docking Adapter-2 (IDA-2) was installed Expedition 48 Commander Jeff Williams and Flight Engineer Kate Rubins of NASA. Other science experiments on board included OsteoOmics to test if magnetic levitation can accurately simulate microgravity to study different types of bone cells and contribute to treatments for diseases like osteoporosis, a Phase Change Heat Exchanger to test temperature control technology in space, the Heart Cells experiments that will culture heart cells on the station to study how microgravity changes the human heart, new and more efficient three-dimensional solar cells, and new marine vessel tracking hardware known as the Automatic Identification System (AIS) that will aid in locating and identifying commercial ships across the globe. The ring shaped IDA-2 unit was stowed in the Dragon’s unpressurized truck section. It weighs 1029 lbs (467 kg), measures about 42 inches tall and sports an inside diameter of 63 inches in diameter – so astronauts and cargo can easily float through. The outer diameter measures about 94 inches. “Outfitted with a host of sensors and systems, the adapter is built so spacecraft systems can automatically perform all the steps of rendezvous and dock with the station without input from the astronauts. Manual backup systems will be in place on the spacecraft to allow the crew to take over steering duties, if needed,” says NASA. “It’s a passive system which means it doesn’t take any action by the crew to allow docking to happen and I think that’s really the key,” said David Clemen Boeing’s director of Development/Modifications for the space station. CRS-9 counts as the company’s ninth of 26 scheduled flight to deliver supplies, science experiments and technology demonstrations to the International Space Station (ISS). The CRS-9 mission was launched for the crews of Expeditions 48 and 49 to support dozens of the approximately 250 science and research investigations in progress under NASA’s Commercial Resupply Services (CRS) contract. Watch for Ken’s continuing SpaceX and CRS mission coverage where he reported onsite direct from the Kennedy Space Center and Cape Canaveral Air Force Station, Florida. An illustration of how the IDA will look when attached to the International Space Station. KENNEDY SPACE CENTER, FL – Following a flawless post midnight blastoff two mornings ago, a pair of NASA astronauts executed a flawless capture of the newest SpaceX Dragon supply ship at the International Space Station early this morning, July 20, carrying 2.5 tons of priceless research equipment and gear for the resident astronauts and cosmonauts. As the orbiting outpost was traveling 252 statute miles over the Great Lakes, NASA’s veteran Expedition 48 Commander Jeff Williams and newly arrived NASA Flight Engineer Kate Rubins used the station’s 57.7-foot (17.6-meter) Canadian-built robotic arm to reach out and capture the Dragon CRS-9 spacecraft at 6:56 a.m. EDT. “Good capture confirmed after a two day rendezvous,” said Houston Mission Control at NASA’s Johnson Space Center, as Dragon was approximately 30 feet (10 meters) away from the station. “We’ve captured us a Dragon,” radioed Williams. The events unfolded live on a NASA TV webcast for all to follow along. Furthermore, today’s dramatic Dragon arrival coincides with a renowned day in the annuls of space history. Today coincides with the 40th anniversary of humanity’s first successful touchdown on the surface of Mars by NASA’s Viking 1 lander on July 20, 1976. It paved the way for many future missions. And Neil Armstrong and Buzz Aldrin were the first humans to land on another celestial body – the Moon – on July 20, 1969 during NASA’s Apollo 11 lunar landing mission. Williams was working from a robotics work station in the station’s domed cupola. Rubins was Williams backup. She just arrived at the station on July 9 for a minimum 4 month stay, after launching to orbit on a Russian Soyuz on July 6 with two additional crew mates. Ground controllers then used the robotic arm to maneuver the Dragon cargo spacecraft closer to its berthing port on the Earth facing side of the Harmony module, located at the front of the station. Some three hours after the successful grappling, Dragon was joined to the station and bolted into place for initial berthing on the Harmony module at 10:03 a.m. EDT as the station flew about 252 statute miles over the California and Oregon border. Controllers then activated four gangs of four bolts in the common berthing mechanism (CBM) to complete the second stage capture of the latching and berthing of Dragon to the station with a total of 16 bolts to ensure a snug connection, safety and no pressure leaks. Crew members Williams and Rubins along with Japanese astronaut Takuya Onishi are now working to install power and data cables from the station to Dragon. They plan to open the hatch tomorrow after pressurizing the vestibule in the forward bulkhead between the station and Dragon. Dragon reached the station after a carefully choreographed orbital chase and series of multiple thruster firings to propel the cargo ship from its preliminary post launch orbit up to the massive million pound science outpost with six resident crew members from the US, Russia and Japan. Among the 5000 pounds of equipment on board is the first of two identical docking adapters essential for enabling station dockings next year by NASA’s new commercial astronaut taxis. This mission is all about supporting NASA’s ‘Journey to Mars’ by humans in the 2030s. Liftoff of the SpaceX Falcon 9 rocket in its upgraded, full thrust version and the Dragon CRS-9 resupply ship took place barely 48 hours ago at 12:45 a.m. EDT Monday, July 18, from Space Launch Complex 40 at Cape Canaveral Air Force Station in Florida. Dragon reached its preliminary orbit about 10 minutes after launch and then deployed a pair of solar arrays. The dramatic ground landing of the 156 foot tall Falcon 9 first stage at LZ -1 took place about 9 minutes after liftoff. It marks only the second time a spent orbit class booster has touched down intact and upright on land. Among the wealth of over 3900 pounds (1790 kg) of research investigations loaded on board Dragon is an off the shelf instrument designed to perform the first-ever DNA sequencing in space and the first international docking adapter (IDA) that is absolutely essential for docking of the SpaceX and Boeing built human spaceflight taxis that will ferry our astronauts to the International Space Station (ISS) in some 18 months. Other science experiments on board include OsteoOmics to test if magnetic levitation can accurately simulate microgravity to study different types of bone cells and contribute to treatments for diseases like osteoporosis, a Phase Change Heat Exchanger to test temperature control technology in space, the Heart Cells experiments that will culture heart cells on the station to study how microgravity changes the human heart, new and more efficient three-dimensional solar cells, and new marine vessel tracking hardware known as the Automatic Identification System (AIS) that will aid in locating and identifying commercial ships across the globe. The ring shaped IDA-2 unit is stowed in the Dragon’s unpressurized truck section. It weighs 1029 lbs (467 kg), measures about 42 inches tall and sports an inside diameter of 63 inches in diameter – so astronauts and cargo can easily float through. The outer diameter measures about 94 inches. CRS-9 counts as the company’s ninth scheduled flight to deliver supplies, science experiments and technology demonstrations to the International Space Station (ISS). The CRS-9 mission is for the crews of Expeditions 48 and 49 to support dozens of the approximately 250 science and research investigations in progress under NASA’s Commercial Resupply Services (CRS) contract. Dragon will remain at the station until its scheduled departure on Aug. 29 when it will return critical science research back to Earth via a parachute assisted splashdown in the Pacific Ocean off the California coast. Watch for Ken’s continuing CRS-9 mission coverage where he reported onsite direct from the Kennedy Space Center and Cape Canaveral Air Force Station, Florida. A flawless shakedown mission from Russia’s newly modified Soyuz capsule successfully delivered a new multinational crew to the Space Station early Saturday, July 9 after a two day orbital chase. The upgraded Soyuz MS-01 spacecraft launching on its maiden flight successfully docked to the International Space Station at 12:06 a.m. EDT Saturday, July 9, while soaring 254 statute miles over the South Pacific. The Soyuz was ferrying the new multinational trio of astronauts and cosmonauts comprising Kate Rubins of NASA, Soyuz Commander Anatoly Ivanishin of the Russian space agency Roscosmos and Takuya Onishi of the Japan Aerospace Exploration Agency on the Expedition 48/49 mission. The three person crew of two men and one woman had launched flawlessly into picture perfect skies two days earlier from the Baikonur Cosmodrome in Kazakhstan at 9:36 p.m. EDT Wednesday, July 6 (7:36 a.m. Baikonur time, July 7), in the brand new version of the Russian Soyuz capsule that has been significantly upgraded and modified. NASA’s Kate Rubins was strapped into the right seat, Ivanishin in the center and Onishi on the left. It was a textbook approach on the shakedown mission that culminated in a flawless docking at the Earth-facing Russian Rassvet module on the Russian side of the massive orbiting outpost. NASA TV carried the whole operation live with beautiful color video imagery streaming from the ISS showing the Soyuz approach and black and white video streaming from the Soyuz. The Soyuz performed magnificently. All of the upgraded and modified systems checked out perfectly on this maiden flight of the new version of Russias venerable Soyuz, said NASA commentator Rob Navias. The Soyuz had slowed to an approach velocity of just 0.1 m/s at docking with the forward docking probe extended. The approach was fully automated under Russian mission control as Ivanishin carefully monitored all spacecraft systems with steady update calls back to ground control. The fully automated approached utilized the upgraded KURS NA automated rendezvous radar system. During final approach, the Soyuz conducted a fly around maneuver starting at a distance of 400 meters. It moved 57 degress around the station while closing in to about 250 meters. After station keeping for about 2 minutes while ground controllers conducted a final evaluation and no issues were detected, Russian mission control at last gave the GO for final approach and the GO command for docking was given. The Soyuz made contact and completed a perfect docking at Rassvet. The hook and latches were then closed in for a tight grasp onto the station. The crews then conducted a series of leak and pressurization checks. After everything checked out, the hatches were finally opened about two and a half hours later at 2:26 a.m. EDT. The new crew members of Expedition 48 officially floated aboard the International Space Station at about 2:50 a.m. EDT, July 9 with the hatches opened between their Soyuz MS-01 and the space station and after a live video transmission link had been established to show the festivities. They were welcomed aboard with hugs and joined the Expedition 48 Commander Jeff Williams of NASA and Flight Engineers Oleg Skripochka and Alexey Ovchinin of Roscosmos. With the arrival of Rubins, Ivanishin and Onishi, the stations resident crew is beefed up to its normal six person crew complement. They soon held the traditional video telecon for well wishes and congratulations from family, friends and mission officials. The new trio will spend at least four months at the orbiting lab complex conducting more than 250 science investigations in fields such as biology, Earth science, human research, physical sciences, and technology development. Rubins is on her rookie space mission. She holds a bachelor’s degree in molecular biology and a doctorate in cancer biology which will be a big focus of her space station research activities. The new trio will join Expedition 48 Commander Jeff Williams of NASA and Flight Engineers Oleg Skripochka and Alexey Ovchinin of Roscosmos. “The approximately 250 research investigations and technology demonstrations – not possible on Earth – will advance scientific knowledge of Earth, space, physical, and biological sciences. Science conducted on the space station continues to yield benefits for humanity and will enable future long-duration human and robotic exploration into deep space, including the agency’s Journey to Mars,” says NASA. The newly upgraded Soyuz offers increased reliability and enhanced performance. Many changes were instituted including enhanced structural performance to minimize chances of micrometeoroid penetration. Engineers also added a fifth battery for more power and storage capacity. The solar arrays are also about one square meter larger and the efficiency of the solar cells increased about 2 percent. Also a more modern command and telemetry system to interact with a new series of new Russian communications satellites that will offer greatly increased the coverage by ground control. This was previously only about 20 minutes per orbit while over Russian ground stations and will now increase up to 45 to 90% of orbital coverage via the Russian comsat system. A phased array antenna was also added with increased UHF radio capability in the Soyuz descent module that now also include a GPS system to improve search and rescue possibilities. The newly upgraded KURS rendezvous radar system will weigh less, use less power and overall will be less complicated. For example it doesn’t have to be moved out of the way before docking. Weighs less and uses less power. New approach and attitude control thrusters were installed. The new configuration uses 28 thrusters with a redundant thruster for each one – thus two fully redundant manifolds of 28 thrusters each. All of these modification were tested out on the last two progress vehicles. Multiple unmanned cargo ships carrying tons of essential supplies and science experiments are also scheduled to arrive from Russia, the US and Japan over the next few months. A SpaceX Dragon is scheduled to launch as soon as July 18 and an Orbital ATK Cygnus should follow in August. The SpaceX Dragon CRS-9 mission is slated to deliver the station’s first International docking adapter (IDA) to accommodate the future arrival of U.S. commercial crew spacecraft, including the Boeing built Starliner and SpaceX built Crew Dragon. A Japanese HTV cargo craft will carry lithium ion batteries to replace the nickel-hydrogen batteries currently used on station to store electrical energy generated by the station’s huge rotating solar arrays. Two Russian Progress craft with many tons of supplies are also scheduled to arrive. An international trio of astronauts and cosmonauts representing the United States, Russia and Japan blasted off in the early morning Kazakh hours today, July 7, for a new mission of science and discovery on the International Space Station (ISS). The three person crew of two men and one woman launched flawlessly into picture perfect skies from the Baikonur Cosmodrome in Kazakhstan at 9:36 p.m. EDT Wednesday, July 6 (7:36 a.m. Baikonur time, July 7), and in a brand new version of the Russian Soyuz capsule that has been significantly upgraded and modified. The launch of the Soyuz MS-01 spacecraft was carried live on NASA TV starting approximately an hour before the usual on time liftoff from Baikonur. The three stage Soyuz booster generates 930,000 pounds of liftoff thrust. The trio comprises Kate Rubins of NASA, Soyuz Commander Anatoly Ivanishin of the Russian space agency Roscosmos and Takuya Onishi of the Japan Aerospace Exploration Agency on the Expedition 48/49 mission. They safely reached orbit at about 9:46 p.m. after the eight minute climb delivered them to the preliminary orbit of 143 x 118 mi. The Soyuz separated from the third stage and the solar arrays deployed as planned. NASA’s Kate Rubins was strapped into the left seat, Ivanishin in the center and Onishi on the right. And precisely because it’s a heavily modified Soyuz, they will take the slow road to the ISS. The crew will spend the next two days and 34 Earth orbits inside in order to fully check out and test the upgraded Soyuz spacecraft systems. That’s in contrast to missions in recent years that took a vastly sped up 4 orbit 6 hour route to the space station. Three carefully choreographed orbital adjustment burns will raise the orbit and propel the crew to the ISS over the next 2 days. They expect to rendezvous and dock at the space station’s Russian Rassvet module at 12:12 a.m. EDT Saturday, July 9. After conducting leak and safety check they expect to open the hatch to the ISS at about 2:50 a.m. Saturday, July 9. You can watch all the hatch opening action live on NASA TV with coverage starting at 2:30 a.m. They will spend about four months at the orbiting lab complex conducting more than 250 science investigations in fields such as biology, Earth science, human research, physical sciences, and technology development. With the arrival of Rubins, Ivanishin and Onishi, the station is beefed up to its normal six person crew complement. The Expedition 48 crew members will spend four months contributing to more than 250 experiments in fields such as biology, Earth science, human research, physical sciences and technology development. The newly upgraded Soyuz offers increased reliability and enhanced performance. Many changes were instituted including enhanced structural performance to minimize chances of meteorite penetration. Engineers also added a fifth battery for more power and storage capacity. The solar arrays are also about one square meter larger and the efficiency of the solar cells increased about 2 percent. Also a more modern command and telemetry system to interact with a new series of new Russian communications satellites that will offer greatly increased the coverage by ground control from only about 20 minutes per orbit up to from 45 to 90% of orbital coverage. A SpaceX Dragon could launch as soon as July 18 and an Orbital ATK Cygnus could follow in August. The Dragon CRS-9 mission is slated to deliver the station’s first International docking adapter (IDA) to accommodate the future arrival of U.S. commercial crew spacecraft, including the Boeing built Starliner and SpaceX built Crew Dragon. The black-and-white tones of this photo evoke a famous Moon walk of 1969, but in reality it was taken in Mediterranean waters just a few days ago. For the “Apollo 11 Under The Sea” project, European Space Agency astronaut Jean-François Clervoy (pictured above) and ESA astronaut instructor Hervé Stevenin took on the roles of Neil Armstrong and Buzz Aldrin, the first two men to walk on the moon during Apollo 11. A major goal was to test the Comex-designed Gandolfi spacewalk training suit (based on the Russian Orlan spacesuits) during the sojourn. The mission was considered the first step (literally and figuratively) to figuring out how Europeans can train their astronauts for possible Moon, asteroid and Mars missions in the decades to come. “The Gandolfi suit is bulky, has limited motion freedom, and requires some physical effort – just like actual space suits. I really felt like I was working and walking on the Moon,” Clervoy stated. Water is considered a useful training tool for spacewalk simulations. NASA in fact has a ginormous pool called the Neutral Buoyancy Laboratory. Inside are duplicate International Space Station modules. Astronauts are fitted with weights and flotation devices to make them “float” similarly to how they would during spacewalks. The first tests for the Apollo 11 underwater simulations began at a pool run by Comex, a deep diving specialist in France, before the big show took place in the Mediterranean Sea off Marseille on Sept. 4. The crew members used tools similar to the Apollo 11 astronauts to pick up soil samples from the ground. “Comex will make me relive the underwater operations of [Neil] Armstrong on the moon, but with an ESA-Comex scuba suit and European flag,” Clervoy wrote in French on Twitter on June 4, several weeks ahead of the mission. And ESA promises there is more to come: “Further development for planetary surface simulations in Europe will be co-financed by the EU [European Union] as part of the Moonwalk project,” the agency wrote. Clervoy isn’t the only European astronaut working in water these days. Starting Tuesday (Sept. 9), Andreas Mogensen and Thomas Pesquet joined an underwater lab as part of a five-person crew. Called Space Environment Analog for Testing EVA Systems and Training (SEATEST), it also includes NASA astronauts Joe Acaba and Kate Rubins, as well as Japanese Aerospace Exploration Agency (JAXA) astronaut Soichi Noguchi. “The crew will spend five days in Florida International University’s Aquarius Reef Base undersea research habitat, conducting proof-of-concept engineering demonstrations and refining techniques in team communication. Additional test objectives will look at just-in-time training applications and spacewalking tool designs,” NASA stated on Sept. 6. “We made it to Aquarius n [sic] did our first “spacewalk” today. From the ocean floor to space: Aquanaut to Astronaut. It is quite the adventure,” Acaba wrote on Twitter on Sept. 10. He walked twice in space on shuttle mission STS-119 in March 2009. You can follow the livestream here (it runs intermittently until Sept. 17). And a few days ago, ESA astronauts Alexander Gerst and Reid Wiseman, both bound for the station in 2014, were doing underwater training in the Neutral Buoyancy Laboratory. “Worked with @astro_reid in the pool today, and guess who we met?”, Gerst said on Twitter Sept. 5 while posting this picture below.